Walking around Venice during a hot summer day can be hard, but a great gelato could restore your energies. You can look for the best gelato in Venice on your own, or you can take some note from our list below. We’ve carefully selected six ice-cream parlors in Venice, one per district. 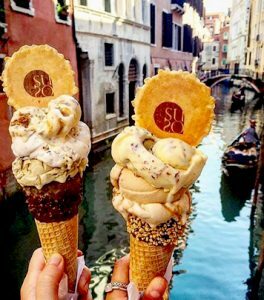 In this way, it doesn’t matter if you are visiting St. Mark’s Square or the Jewish ghetto, you’ll always have the chance to be near a trusted ice-cream parlor. This is one of the most known ice-cream parlors in Venice, not only because of its strategic location but mainly for its so-called Gianduiotto. You won’t eat just a gelato here, but a yummy ice-cream with a big Gianduia chocolate bar on the top. Not far from our hotel, a new ice-cream parlor has recently opened: Gelato di Natura. All the ingredients this gelateria use for its ice-creams are completely natural. We suggest you taste a cone with figs and ricotta or a classic pistachio. This tasty ice-cream parlor is away from the most bitten paths in Venice, in fact, you have to cross Sotoportego de la Bissa from Campo San Bartolomeo and go straight. You’ll find it, for sure, and order a cone with salty pistachio and lemon with chocolate. This is not only a place to eat the best gelato in Venice but a place you can call home. The gelato here is cheap and tasty. This ice-cream parlor is located in Castello district, where you’ll surely find some peace and a perfect moment to sit and enjoy a local Venice. If you like yogurt, this is the place where to stop by. In fact, the Fontego delle Dolcezze make both homemade gelato and yogurt. If we might give you a suggestion, try the chocolate with cardamom flavor. Few steps away from one of the most visited and beautiful churches in Venice, Basilica dei Frari, there’s a small ice-cream parlor, called Gelateria Millefoglie da Tarcisio. Don’t get fooled by the fact that there’s a sliced pizza place right next to it, the ice-cream here is amazing. Feel free to print and bring this list of the places where to eat the best gelato in Venice with you, while you’re visiting our amazing city.